I didn't get up as early as I'd hoped to, no doubt because the morning was overcast with no streaming sun coming through the east window to wake me up and no alarm clock set on a day off to force me up. But when I finally woke up, I ran to the window like a kid on Christmas morning who is anxious to know if it snowed the night before. Only, I, a gardener with an extra day off in the summer time, was wondering if it had rained or was raining. When I looked outside, it was clear that it was wet outside, but the rain gauge was nearly empty, so it must have just sprinkled enough to wet everything down a bit. I stood there for a minute looking out at the garden, wondering if these sprinkles were the end of the rain or the beginning of the rain. Should I plan to work out in the garden, or plan to continue cleaning inside? It was clear that I surely needed to do both, At mid-summer, purslane was once again making its best attempt to become the number one crop in my vegetable garden and the thistle plants were scaring all the perennials in Plopper's Field, or so it seemed to me. Inside, I'd drug in enough leaves and bits of grass on my shoes over the last few days that I almost had enough to start an indoor compost pile. As I stood there, looking out at the garden, considering my options, I noticed something hanging from a low branch of the locust tree. Curious about what it was, I ventured out to take a closer look. It was a green bandana. I stood and stared, almost not believing that it was really there. I had hoped for so many years, wondered through season after season if it would ever happen to me. Yet, there it was, hanging in the tree. I had always thought I'd get the green bandana in the mail, or someone would just give me one. I never dreamed it would just show up in my garden like that, tied to a branch of the locust tree. My spirits lifted immediately. This was going to be a grand and glorious day, regardless of the rain. This was going to be a day I would circle on my calendar and look back on with fondness. 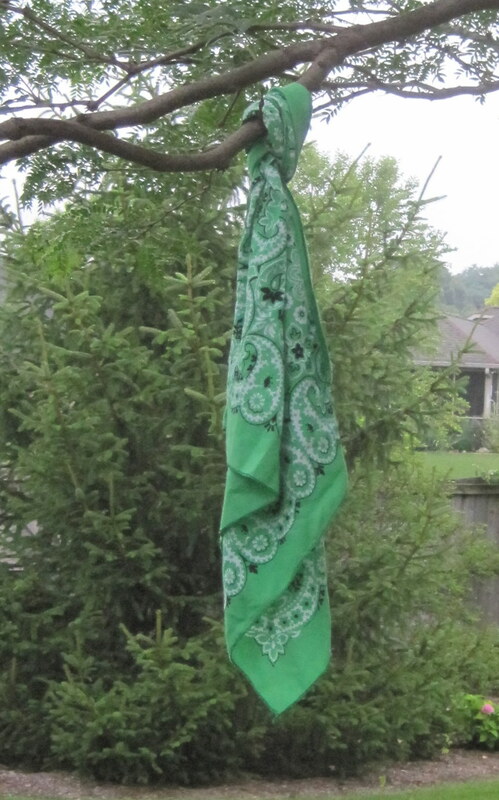 For today, the green bandana was hanging on a tree in my garden. Yes, finally, I had my invitation to join The Green Bandana Garden Club! What a great surprise. Can't wait to hear more about the Green Bandana Garden Club. I have never heard of The Green Bandana Garden Club before. Hmmmm? Will there be more? It's a green-letter day for you. We are all curious! I hope you fill us in in the coming days. What a great way to be invited into a club. I am already thinking of ways I can use the idea myself. Can't wait to hear what that means. Fun to find a surprise like that in the garden. It certainly is a green bandana day. I hope you make the most of it. I'm back. Your fabulous sense of humor and your hoe collection has inspired me to make a garden straw hat collection. I linked back to you as my inspiration. My funny straw hat collection is over on the left side. 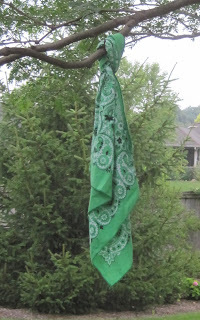 BTW: There's no mention of the green bandana garden club on the internet. Is it that secretive? Luckily you haven't been invited to join the Green BANANA Garden Club. Having a bandana hanging in your garden is more discreet! It sounds something like a Fight Club, be prepared and keep us posted! There are always so many happy mysteries in your garden. At least I hope this is one of the happy mysteries and the fairies aren't just messing with you. This was a great read! thank you! i too am curious about this club!